Youth program information for preschool, religious education, Seton Parish Youth (SPY), and vacation bible school. 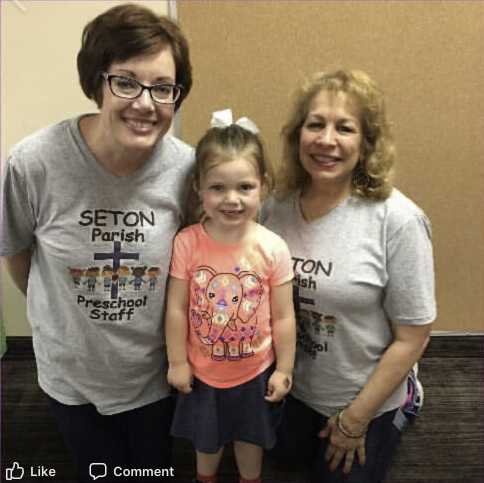 The Seton Parish Preschool is dedicated to promoting and strengthening the Catholic faith within a nurturing and supportive learning environment. Religious education at Seton Parish is designed to promote catechesis and education as a solid foundation that children can carry with them into adulthood. This is accomplished by teaching and fostering formation through Sacred Scripture, doctrine, and Tradition of the Roman Catholic Church. We strive to model Catholic practices and values and promote participation in liturgical worship and the sacramental life of the Church. We are committed to providing an environment that will allow children to learn, experience, and grow as members of our Catholic community. Children's Liturgy of the Word (CLOW) is offered during most 9:30 a.m. and 11:15 a.m. Masses and is a wonderful way to assist our children in focusing on the Sunday Liturgy. It is an opportunity for the child to hear the same readings as the adults, but on a level they can better understand and appreciate. The mission of Seton Parish Youth (SPY) is to empower young people to always continue their faith formation, respond to the pastoral needs and concerns of the youth, and foster their participation in the community and mission of the Church. Throughout the year, SPY organizes Sunday evening Masses, performs various outreach and charity activities, and attends the large National Catholic Youth Conference. Each summer, Seton hosts an interactive Vacation Bible School program that includes skits, activities, and music to bolster the faith of the children. VBS is an exceptional way to learn more about the Bible and the love God has for each of them in a fun and exciting way.